Bitcoin and the blockchain weren’t Satoshi Nakamoto’s only lasting legacies. Another vibrant system left behind was the famous Bitcoin Forum, which has become not only a cornerstone of development and meeting place for like-minded intellect, but a vast ecosystem and launching pad for blockchain-related products. In part 2 of our 3 part series on the forum we explore the forum sections (boards) in depth to provide you with a helpful guide for how to use it to your advantage. Lending: where members can go to request or offer loans in the form of bitcoin (or altcoins). Investigations: as this board is off-limits to guests (casual browsers who are not logged in) and Newbies, personal information on those suspected of pulling a scam can be posted here. If you are brand new to the forum and have never owned an account, the registration process is quite simple. Just click on the “Register” tab toward the top of the page, create a novel user name, enter an email address, and create a password. If your IP address has previously been connected with a scam or other sort of fraudulent behavior on the website, you will have to pay a nominal “evil fee,” in order to “atone” your account, otherwise known as removing a “proxy ban.” This is the only time in which a registration fee will ever be charged to use the forum. As a “Brand New” member (that’s a member without any posts or activity – we explained the different member rankings in part I of our series), you have access to pretty much all of the forum, sans the Investigation section and other sections only viewable by administrators, moderators and VIPs. In order to prevent mass spammings, Brand New members (as well as Newbies) are only allowed to post a certain number of posts per hour. They also do not have the ability to wear an avatar or add text to their signature space (these are reserved for members who have ranked up to the Full Member and Jr. Member levels, respectively). Personal Text: a custom message that is stored below your user name when viewing posts. Signature: shown at the bottom of every post, a customizable area that can contain links, BBcode graphics and text (the sophistication of code permitted is dependent on user rank). Website Title / URL: if a member clicks on your Profile link they will be shown this information. Bitcoin address: an area to store a bitcoin address associated with your user profile. A first step in learning how to properly use any forum is to know the rules! Due to the number of people who sign up to use the forum on a daily basis – many with less than honorable intentions – Bitcointalk has some rather stringent policies regarding usage of their forum. Over 400 people sign up for the forum on any given day, many with dreams of striking it rich by collecting tokens from bounty programs. This encourages them to write a large number of posts for the sake of advertising an ICO or other product in their signature space. All-too-often, people become lazy about generating their own content and end up plagiarizing the material of others. Even if they aren’t immediately caught, and even if they only did it once, they can be caught and permanently banned from the forum months (or even years) after the fact, meaning the work one has put in to ranking up their account and gaining a reputation can quickly be taken away from them for choosing to take the short cut of plagiarism. This is perhaps the biggest and most common no-no of forum members and can cost them everything if caught. Of course, it is ultimately up to a forum moderator to decide whether or not a reply is considered “spam,” and for the most part, members are not banned for anything that could be argued not to be spam. The remaining list of ban-able offenses is pretty much common sense stuff: don’t threaten, extort or blackmail other users, and don’t break common laws or engage in explicitly illegal behavior. Interestingly, members are usually not banned for promoting scams or engaging in fraudulent behavior, unless their involvement has been proven beyond a reasonable doubt (such as by a court of law). Members are also not banned for selling or trading forum accounts, although this activity is highly discouraged. In this way, the forum is extremely open minded and tolerant of most user behavior, with the administrator (theymos) opting to maintain a “hands-off,” “innocent until proven guilty” approach to moderating the forum. What is considered to be a scam can be highly subjective and hard to prove. Plagiarism, on the other hand, is quite objective and rather easy to prove. Theymos wants to welcome as many people to the forum as possible and create a non-threatening environment in order to maximize the contributions by talented new members. Ergo, it is incredibly easy for anybody to become a member, and pretty hard to get yourself banned (unless you break one of the cardinal rules of the forum, as mentioned above). Indeed, spirited discussion takes place in multiple sections of the forum every day, some of which has helped bring novel, worthy ideas to fruition, sometimes even making improvements upon elements of bitcoin or cryptocurrency as we know it today. 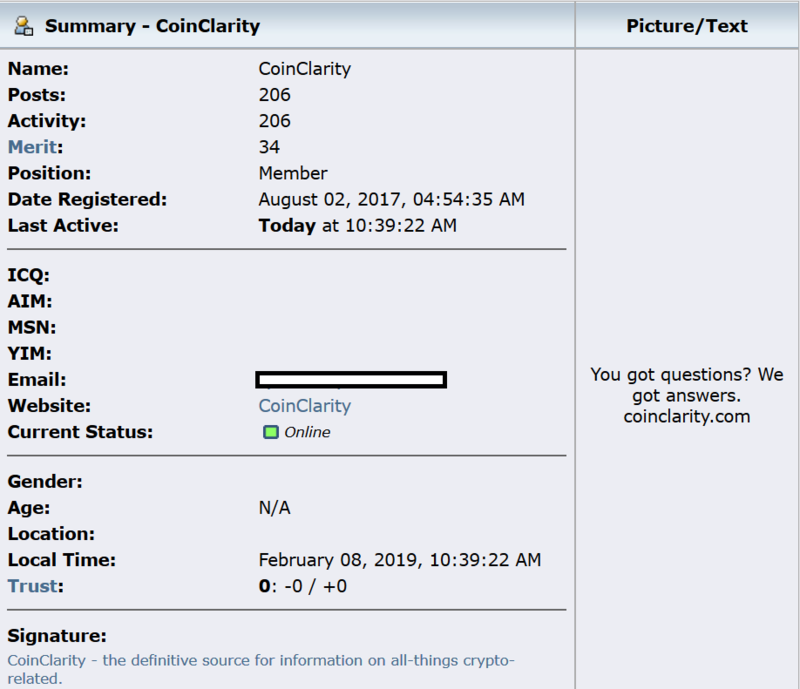 Now that you’ve been given some background and basic tips on how to get started, let’s proceed with an explanation of how to find exactly what it is you are looking for in the Bitcoin Forum. As we mentioned earlier, there are four main reasons why people use the forum, and we will go through them one at a time for you here. 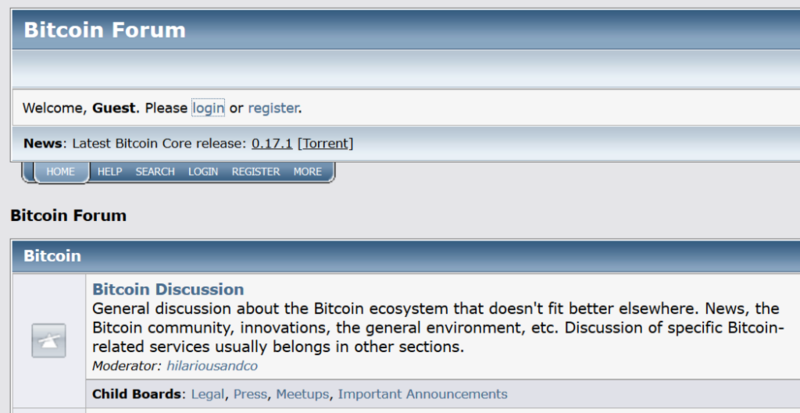 Since the primary subject of the forum is bitcoin, there are several sections dedicated to its discussion. For absolute beginners, the Beginners & Help board offers an extremely comprehensive list of resources and is maintained by more seasoned members that can help you find the answer to just about any bitcoin or crypto-related question. The most general information can be found in the Bitcoin Discussion board, which is a catch-all area for items that do not fit specifically in other sections. For discussion about the Bitcoin software client as originally released by Satoshi Nakamoto, check the Development & Technical Discussion This is where the meat of bitcoin development used to take place, and still does, though to a lesser degree. For questions related to Bitcoin Core, nodes, the Bitcoin Network, transactions and addresses, check the Bitcoin Technical Support You will likely find the answer to any question you may have about the technology behind how bitcoin functions here. For questions about mining, check the Mining Here you can find answers to questions about miner configuration, efficiency, and how to set up or join a mining pool. Goods: for the trade of physical items, such as clothing, artwork, physical coins, computers, mining equipment, and other electronics. Services: for the trade of work and labor, such as coding, writing/editing, marketing, promotion and website building services. Gambling: for everything gambling related, including promotion of bitcoin casinos and dice sites. Lending: It is possible to ask for loans in the form of bitcoin (or an altcoin) on the condition that collateral is provided, usually equal to 110%-120% of the total value of the loan. Keep in mind that if you are a Newbie, asking for a loan without the provision of collateral is regarded as untrustworthy behavior, and will result in your account being tagged with negative (red) trust. Currency Exchange: for the exchange of digital to real (fiat) currency, usually in the form of PayPal, Skrill, Perfect Money, Neteller, etc. Securities: cryptocurrency-related “stocks” and “bonds” can be traded here, usually representative as shares in a crypto or mining investment plan. Auctions: goods and services being sold in the traditional, “highest bid wins”-type style. Do not trade with members who have a negative trust score, especially if their trust history contains accusations of scamming during a trade, loan defaults or otherwise untrustworthy behavior. While there are many reputable members of the forum who have a long history of successful trades, there are even more scammers who come and go, hiding under the anonymity of the forum (and bitcoin) to leave other members high and dry. Avoid “sending first” in a trade, unless you are dealing with a highly reputable/trusted member of the forum. Use an escrow service to hold payments or collateral to be used in a trade. This will greatly reduce the chance of being taken advantage of or ripped off during a trade. Most escrow services will only charge 1-2% of the total amount being escrowed for their service. Do not beg for free stuff or bitcoins. Similar to asking for a loan without collateral, it is considered untrustworthy behavior and will likely leave your account with a negative trust. Don’t accept PayPal as a means of payment unless if from a highly reputable, trustworthy forum member. This is because unlike bitcoin, PayPal payments can be reversed, leaving you out your sold item and the money from your PayPal account. Stay away from HYIPs (high yield investment programs) and Ponzi schemes, even though they have their own section in the forum (called “Investor-based games”). They are extremely risky at best and outright scams at worst. Don’t attempt to engage in trade for the sake of earning positive (green) trust; this behavior is also looked down upon by the more senior forum members and could actually have the exact opposite result that you are intending (placement of negative trust upon your account). As a hub for crypto-related development and creative enterprise, it only makes sense that up-and-coming cryptocurrencies would choose to start a thread for their project on the Altcoin (Announcements) board. All other social media platforms (such as Reddit, Facebook, Medium, Telegram) pale in comparison to the sheer amount of attention a project can get by listing itself on this particular board. 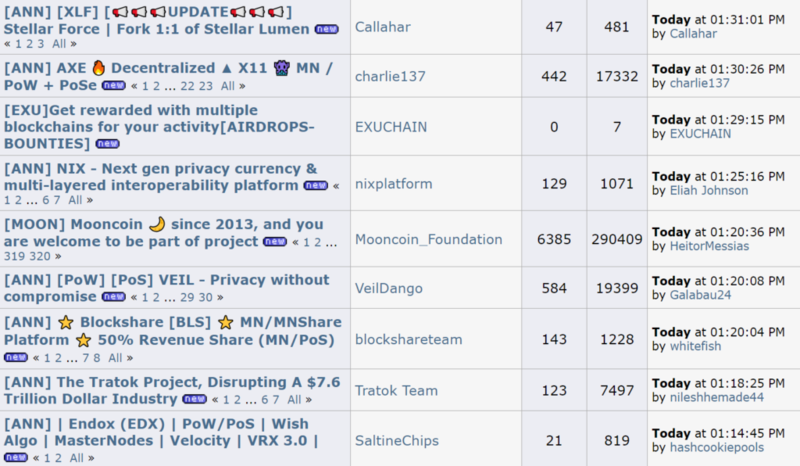 The statistics are astounding: at over 6.9 million views with 2.7 million posts across nearly 90,000 topics, the Altcoin (Announcements) board is by far the most popular board in the forum. Here you can witness the rate at which new projects are being created, which is simply astounding. While there is probably no better place in the world to announce your cryptocurrency or blockchain-related project, competition is extremely fierce, and project announcements can be pushed off the first page (there are 32 listings on the page) in a matter of minutes. For a project to really be successful, it’s going to take more than a clever idea and a well-worded announcement to get noticed, however. It still undoubtedly requires a coordinated marketing effort to bring in traffic from other sites and inspire others to write comments on your thread (known as “bumping”), but once your announcement has gathered some momentum and accumulated a decent view and post count, the chances of getting the ball rolling for your project are greatly increased. Simply put, the Altcoin (Announcements) board is where dreams are made: an incredible bastion of freedom and uninterrupted, free market capitalism at its digital finest. Its where potential investors flock to from all over the world, hoping to get in on the next biggest things while prices are still low. It’s also where miners go looking to mine the newest coins for the exact same reason. Look for project transparency above all else. You might think you’re about to invest in “the next Ethereum” due to the professionalism of a project’s white paper and website, being heavily marketed and supported by what appears to be a rabid fanbase chomping at the bit to invest, but all of these factors can be easily faked. What can’t be faked is confirmation of the identities of the project team and leadership. Simply put, don’t invest in projects without legitimate, verifiable team members – preferably those with previous, established experience in the blockchain industry. Fake teams are rampant, and a reverse image search of team members can help confirm whether or not an ICO is engaging in this tactic. Check to see if a project has plagiarized its white paper by simply copying some non-specific text from it and pasting it into a Google search. You would be amazed at how many ICOs take the shortcut of plagiarizing their white papers, and this is usually a sign that a project is not sincere, potentially even a scam. Be highly selective and take your time. Don’t be the victim of being caught in an artificially engineered FOMO (“fear of missing out”) experience. Keywords ICOs throw around like “bonus,” “discount,” and “special offer” should all be treated as suspect. They are simply advertisement strategies used by any other product. Recently, the trend of “masternode”-based coins has become all the rage, where for a certain investment amount, an investor can be guaranteed steady income (in the form of coins) by running a “master node” which collects transaction fees from the network. If nobody uses the network, or the coin fails to attain any value (as frequently happens), this could turn out to be a completely value-less selling point, and such coins that place heavy emphasis on this feature should be avoided. Finally, we get to the section that many readers of this article might ultimately (solely) be interested in. Since the great ICO boom of 2017, there has been a tremendous influx of new users to the forum that have one purpose in joining: to make money as a bounty hunter. If you didn’t know already, “bounty hunter” is the glorified title given to those who help advertise or otherwise promote an ICO by wearing an advertisement for the ICO in their signature space. Up until about 2017, the term “bounty hunter” traditionally referred to those who were actually performing work on behalf of an ICO: translating a white paper, testing out software, designing a logo or other graphics, developing a website, etc. – all of these tasks were rewarded in the form of a “bounty,” which is a set number of ICO coins/tokens distributed to a user for completing the task. At some point, this term began to include signature campaigners, which is what 99% of all bounty hunters currently are. Previously, signature campaigning was an entirely different category and usually involved getting paid in the form of BTC (or a major altcoin) for sporting an advertisement in the signature space for a bitcoin-related service (such as a crypto casino or mixing service). With the rise of ICOs, this began to include an increasing amount of ICO advertising, which is now the clear majority of all signature campaigning. Though measures were put into place to reduce the number of bounty hunter posts or else discourage them from using the forum as a source of income, new bounty hunters continue to flock to the forum on a daily basis, seeking to “earn” extra income by spamming the forum, generating at least 50% of the posts written today. They tend to dump their coins/tokens onto the open market as soon as they are given their reward, thus potentially crushing its price after the close of an ICO. They sometimes abuse campaigns by registering multiple (“alt”) accounts to the same bounty (even though prohibited, this is a common problem on the forum). For non-signature related social media campaigns, they frequently manipulate their friend/follower/subscriber counts in order to make it appear that they have more influence than they actually do. Quite often, they will be “friends” with rings of other bounty hunters, advertising projects only to other bounty hunters and bots. “One of my friends launched a project and of course the bounty campaign was started too. After checking statistic via google analytics I found out that traffic coming from Twitter + Instagram + Facebook = less than 3 % of total traffic.. I decided to try scammers method myself. Here is what I did. Bought Twitter account with 2,000 followers for $ 10… I was sure that twitter Audit will be less than 50% because followers are mainly bots. But twitter audit showed 87% and that was more than enough to enter any bounty campaign here on bitcointalk. As you can see, I could enter any bounty campaign, having all accounts mentioned above. All in all, bounty hunting (and old-fashioned signature campaigning) is not nearly as lucrative as it used to be, but for better or worse, it is still an integral part of the forum which no doubt drives millions of clicks to the forum ever month. As long as there’s BTC to be paid advertising casinos or mixing services, and as long as there’s still a chance that an ICO product could go on to be a top 10 coin someday, there will still be campaigners making the most of their alloted signature space. This concludes part 2 of our series on the Bitcoin Forum. Tune in next week as we bring you some perspective from long-standing members of the forum and discuss where the forum might be headed next.